As a Real Estate Investment Trust (REIT) investor, I been hearing a lot of less desirable comments recently. No doubt they have been linked more to that there are more vacancies in shopping malls around Orchard. Middleground did a piece on whether REITs will kill or save Singapore’s shopping malls. The biggest hearsay is that REITs create an artificial environment where the fundamentals are non-existent. They are a bubble waiting to burst. I find this way of thinking really absurd. What does it mean by fundamentals to be non-existent? When we describe fundamentals to be non-existent, it means that the prices of the financial assets are artificially propped up. Whatever, that the managers, majority shareholders, and sponsors do to affect the REIT and its underlying properties will not result in positive and negative outcome. It also means that the investment properties held by the REITs are not affected by the basic laws of property investments. However, through the manipulation of the share market, cornering it, doing stock market operations, they are able to jack up or bring down the REIT at their whim. One of the argument is that the REIT managers keep raising rents, so much so that the poor tenants or prospective retailers will have to take the higher rent. This is how the rent is being jacked up. I find one good case study to be that of Bedok Point. In September 2011, Frasers Centerpoint Trust (5.9% Dividend Yield) acquired Bedok Point, which was an old cinema in Bedok converted into a shopping mall. My friend lives in Simei, and Bedok Point have become one of his favorite haunts as a young yuppie. The mall caters more to the suburban crowd with much eateries, which is a common theme similar to Causeway Point and Northpoint. The mall was frequently packed. In December 2013, Bedok Mall by Capitaland opened for business. Bedok Mall is located within an integrated bus interchange next to the Bedok MRT. Suffice to say, the location is much better. The first week, a visit at Bedok Point is truly gruesome. Vacancy went up. Here are Bedok Point’s figures taken from FCT annual report over the years. Since the opening of Bedok Mall, Revenue growth and NPI growth have been adversely affected. While occupancy is still good at above 90%, you can see the rental reversion is very different from FCT’s other malls as well as Capitaland Malls shopping malls. If the investment properties under FCT is not governed by the basic demand and supply, or that better location is a factor, then Bedok Point should not be showing this set of data. Regardless of location, demand and supply, they should achieve positive rental reversion isn’t it? They shouldn’t have to lower the asking rent isn’t it? There is also an argument that the REITs ended up earning money, whether the retailers make money or not. The high rents are killing them, or making the risk of doing business to be extremely high. The above sales and occupancy cost data comes from FCT’s annual report. It aggregates the sales data of their tenants and the rent they pay. A high percentage indicates that the rent is unsustainable. It indicates to investors that we should be wary that rents will stagnate or be reduced. The figures will probably show that rent is a smaller percentage then you realize. If we add another big component, which is manpower, there are still much margins to work with. The table above shows the occupancy cost of some retailers who have their business residing in shopping malls. We do not see a trend that the REITs are raising the rents to an unsustainable levels for them. The rent/operating lease expense to revenue is largely consistent. 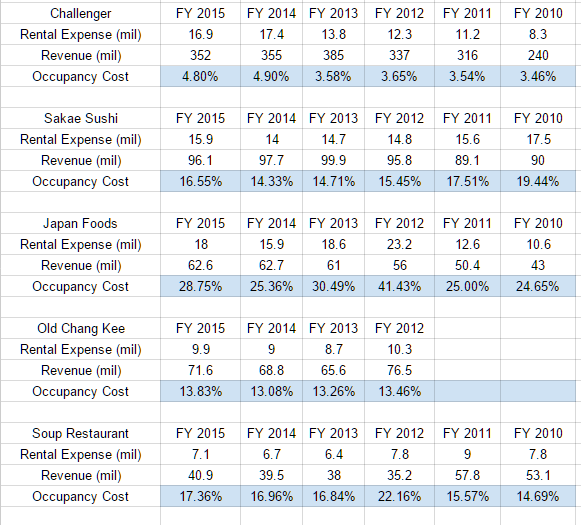 Paying attention to Soup Restaurant, we can see that their revenue is falling and so is the rental expenses. It doesn’t mean that the REITs are not charging them lower rents, it means that retailers will optimize when business is not doing that well. The real argument here is between the retailers that have scale and those that are trying to create something. The former have much scale to have centralized kitchens to optimize costs while the latter do not have that luxury. Most of all as a small entrepreneur effort, the retailer do not have the capital to bleed and turned the business around. Their rent is higher than the Sakae Sushi and such because they cannot attract traffic themselves. If REITs charge higher rents then non-REIT shopping malls, why don’t you as the retailer go to non-REIT shopping malls? There is the argument that REITs get a bad reputation and cramp up entrepreneurship for impeding creativity. I stated that I agree with that argument for the REITs but I do not think it is the factor that crap up entrepreneurship. The REITs do not owned all the shopping malls. Last I know, NEX in Serangoon is not owned by a REIT, Jurong Point is not owned by a REIT (if memory serves me well its owned by Lee Kim Tah). You have retail spaces in the spaces owned by SMRT. 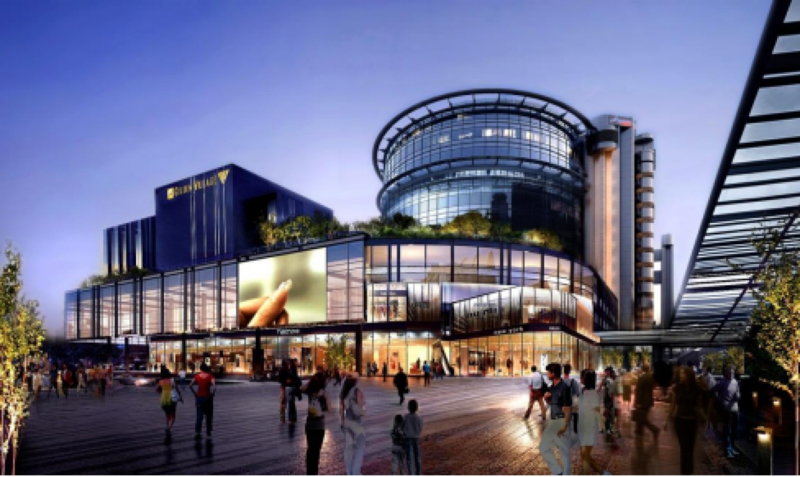 You have integrated retail spaces such as the Paya Lebar Square. These are all next to MRT stations and good locations. They should be cheaper since they are not owned by REITs isn’t it? Right now, we heard of the vacancies in Shaw House in Orchard. The rent should be cheaper which should be more affordable to a startup retailer. If REIT’s mall is expensive, then these shopping malls should have more inquiries then the REIT’s mall. Is that the case? As a start up, you will be flocking to Shaw House and Far East Shopping Center. You can test your concept there and if you are successful, you can then move on to a mall closer to the main MRT stations. The reality is, you would not want to do that. These places have a domino effect in that due to the vacancy and poor shop themes, are not going to attract traffic which is what you are looking for, whether you are a big or small retailer. What you are paying for is the proximity, the location to stronger people traffic. If REIT malls have no fundamentals, location should not matter. If prices are the be all end all, you would take the rents of the malls at Shaw House, Bedok Point, Lucky Plaza in a heartbeat. My friend told me a tale of his wife’s hairdresser, who was based in Paragon Shopping Mall, deciding to move to Mandarin Gallery. And then the hairdresser had to move back to Paragon Shopping Mall. These malls are so close to each other and if fundamentals do not matter, that how the manager sets up the theme of the mall doesn’t matter, a hairdresser should not have to bite the bullet to shift back to a more expensive retail space. Location does matter, shopper’s traffic does matter, and how the manager sets up the mall does matter. I stayed in Seng Kang for 18 years. Which is as long as Hougang Mall have been operating. I went there in the first week. And I was so demoralized how drab or unappealing that mall looks. I stopped visiting that mall for some time since it is a few bus stops away. Then CMT bought it over. In 1 years time, they turned the mall around to bring in some quality eateries, which is what would be more demand for a suburban mall, and made use of the spaces better. There were also more shops that cater to our daily needs, overall it became a more desirable shopping place. To be fair, REITs tries to work their magic but not always succeeding. A similar case study can be drawn of another close by suburban mall, Rivervale Mall in Seng Kang. If mall operators do not matter, and do not value add, then we should not see such differing results. There is no difference whether the space is owned by a REIT or not a REIT. Are you going to say that a non-REIT owner of a mall, an industrial space is altruistic and not profit driven? If the malls keeps rental low, they are going to get a flood of prospective retailers. They will have a joy time, selecting the retailers they want to work with to provide the best tenant mix. If it is so cheap, for each space there are 5 prospective retailers how does the retailers get their hands on the space? They will be willing to pay more to rent. Just as the example of Bedok Point, if rents are unaffordable, are the malls going to put a gun to the head of the retailers such that they have to signed a 3 year lease even if business is unsustainable? The ones who couldn’t afford will move out, but the REITs gain positive revision of rents because some retailers think they can make it work. Fundamentals still governed, and we recently have seen the industrial REITs, office REITs facing some oversupply and a tough time hanging on to their tenants. They are not thinking so much about raising rent. These are all fundamentals at work. When economy doesn’t do well, businesses fold, the malls and industrial spaces occupancy gets affect. REITs or no REITs, if you owned an industrial space, you suffer. FYI. Not all reits are listed. There are private funds which owns malls. Hougang mall is owned by AsiaMalls not CMT. oh you meant they have purchased over? i always thought CMT bought over hougang mall. I think it has never been under CMT from my distance memory. They do previously own the mall next door, cannot remember the name which mayb called hougang 1 or something. It was sold and redevelop now. U may wish to know largest share holder of reits maybe fix income institution investor. May not b retail investor. As fix income investment they may have low tolerance of share price fluctuation. Further, different retailers have different occupancy cost structure which will tell you they are doing well or not. Etc electronics counter which cost of products are high but low margin, so to be sustainable it has to work on low occupancy cost. So different retail business will have different occ cost and it is never the same for each. It’s only a good gauge. hi roy, apologies you are correct, then in this case asia malls are good operators as well. it does show skill is not limited. when you say they have low tolerance to share price fluctuation, are you referring to the institutional investors? i agree with the different occupancy costs, perhaps it does not show coherent picture, but if there isn’t any business they would have close more shops to concentrate on a few places. CMT used to own hougang green. hi Anthony, or was it capitaland owns it. That is surprising. I have to say I enjoyed your post. The “ghost malls” of Orchard pretty much sparked the appearance of experts around me. All of a sudden, everyone has an opinion on REITs! Anyway, retail REITs are but only one category of REITs, and within retail REITs we also know not all REITs are the same quality. Many people just think online shopping = death of malls. So tired of repeating myself that it really isn’t that simple. Asked them to read Bobby Jayaraman’s book Building Wealth Through REITs first haha. hi kevin, yes i think it is the broad stroke of the brush that i am trying to address. the bobby jayaratham book is a very good read but sadly i put it in the office for months and no one picks up and reads it. 1. How does the occupancy cost % compare to the retailers’ net margins? If retailers are earning <10% net margin, it appears that retailers are paying more of their gross profits to the landlords than they are keeping for themselves. If so, it adds to the argument that retailers are indeed struggling as they have to sell more sushi or pastries (as the case may be), to pay the landlord first. 2. How does the occupancy cost % for Singapore retailers compare to its neighbouring peers, say KL or Bangkok? Any discrepancy in occupancy cost % may help to explain the longevity of retail stores, or lack thereof, e.g., there have been some well publicised closures of well known brands in recent months. How easy/difficult is it to build a retail business of sustainable scale given current rentals? Interesting article and agree that not all REITs or tenancy management is the same. Having a good tenancy mix and providing a good eco system of services in a mall will be the most important in the next couple of years. Occupancy cost looking at a macro level across countries or different business type is not realistic. Example like clothing stores have less manpower cost and more rental and inventory cost. F&b is manpower and rental etc. Next in line for comparison is the location. Occupancy cost in orchard and in hougang for the same retailor. Chain stores need orchard exposure and keep brand name relevant. If I were a retailer, I would go for lower base rental and more percentage on sales for sustaining a manageable occupancy cost. This however will only be more negotiable in the next few years when landlords losses more tenants. Larger brands have also negotiated rental based on occupancy costs calculation using it as a cap on percentage rental. Bottom line is that landlord wants to have a successful tenant in its mall. hi zeag, long time no see. hope you are well. those are really good thoughts from someone who have competency in this area. from your experience across the region how do you view things? From my perspective, I’m seeing that retail mall owners Are starting to think like service providers than just landlords. Malls that does not have a range of services that can occupy 3~4 hours of people time will be doing badly. Think of malls with no supermarket, cinema, public transport hub etc. Those malls specified in the article on bad occupancy have bad tenant mix affecting the crowd pull. As an example, many tenancy teams have gone to get F&b tenants making up a good 30% of tenant mix to act as crowd pullers for small size families with high disposable income. There will be a good shake up of retail brands. Gone will be the days of giordano or Bossini. Uniqlo and online shopping is starting to strangle their market segment. Moving forward, malls will be less shopping, more eating and entertainment. hi siew dai, apologize for no caps as my keyboard has an issue. I think what i omit to compare is versus overseas comparables. then again these data is not always published. even Cmt do not published this so i am told. challenger is low margins, and so that is why the occupancy cost looks so good. i do not like this measurement, but if i use net profit or ebit, there are flaws as well. I have been thinking more or less the same thoughts. Anyway, some negative publicity may be good to lower prices of REITs, which may create opportunities for people who can see the value. Better than REITs getting hyped up to sky-high prices, which is only good if you already have plenty and want to divest. that’s a lot of rage. agree with lots of points in the post above. but when you look into it, he is not really arguing against retail malls facing competition. but against biasness against REIT malls. so the title confused me. my response is not just the articles, but the common hearsay. what do you mean the changing mix in malls? not really, just got something to answer about. Just over the weekend, I was walking around the Paya Lebar area. I was at oneKM, Paya Lebar Square and… City Plaza. Although the crowd was thin for the weekend, it was especially so at City Plaza. I didn’t even bother to go up to the 2nd floor, whereas I walked around and explored at both the other malls. Just because commercial property in general is not doing well isn’t a reason to blame REITs, since the non-REIT shopping malls are probably doing much worse on average! Personally, I see the benefits of patronizing a REIT shopping mall (or even a managed shopping mall for that matter, not necessarily a REIT). The tenant mix is usually better if you’re just a casual shopper and the shared spaces, facilities (toilets and carpark) and programmes are much better. However, non-REIT shopping malls do have their part to play with their niches and lower costs (think Sim Lim for IT and Queensway for Sports Apparel). But hey, on the bright side, if everyone hates REITs so much, that makes them undervalued with higher margins of safety and higher yield for us investors that are left! Hooray! How can it be true that fundamental is not important. The manager of the reit is extremely important. Hear what John lim have to say briefly about Reit’s fundamentals. There, he discuss about e commerce risk to Reits, co cannot ignore but need to transform. He also discussed about reit cannot just increase and increase rent forever, and how one example of Suntec to illustrate how they tackle this problem. Ok… I m not vested in Suntec. CRCT has a component of retailer rent peg to sales. This is one example of showing how reit and retailer can work closer together although there will be a danger if retailer sales drop, but at least they will not seek to vacate immediately..